The program has modified 5,000 toy cars for infants and kids up to three years old, according to Sam Logan, assistant professor at Oregon State University’s College of Public Health and Human Sciences. OSU opened its chapter in 2014. Researchers at Oregon State University have developed a water-resistant and antimicrobial edible film that has the potential to extend the shelf life of foods with wet surfaces, such as meat, cheese, and cut-fruit and vegetables. There’s a 5-year age spread between Lilly Paradis and her older brothers Pierre and Tim, but the way things worked out, all three will be graduating from college at the same time. When the Oregon State University Class of 2017 marches down Southwest 26th Street to Reser Stadium on Saturday to receive their diplomas, the siblings will be walking together — something none of them could have foreseen when they were growing up on the family’s 60-acre vineyard near Silverton. You’ll have to hurry if you want to catch Christopher Willett: He’s a young man on the go. He’s graduating from Oregon State University on Saturday with a bachelor’s degree in political science, but in order to pick up his diploma at commencement, he’ll have to fly back from Ohio, where he’s already started taking law school classes at Ohio Northern University. “The Willamette Valley has a really long grazing season, probably eight months of grazing in a year, which is considerably longer than a lot of places. It grows great grass,” says Rebecca Thistlethwaite, program manager for Niche Meat Processor Assistance Network, which runs out of Oregon State University in Corvallis. “We’re working with various plant producers to bring trials to campus,” explained OSU landscape coordinator Sylvan Pritchett, who helps care for the garden. The test garden used to be at Oak Creek, but two years ago, the OSU facilities department decided to move it to the front of the ILLC, where it is much more visible to pedestrians and to traffic on Western Boulevard. A coordinated effort to understand plant microbiomes could boost plant health and agricultural productivity, according to a Perspective published in the open access journal PLOS Biology by Posy Busby of Oregon State University and colleagues at eight other research institutions, including Colorado State University. “Unfortunately, I only have about 50 left over,” said David Gibeaut, an Oregon State University horticulturist who helped develop new cards, officially called Pacific Northwest Sweet Cherry Development Index Charts. Rob Blakey of Washington State University in Prosser has about 150 left, he said. Scientists with Oregon State University and the USDA Agricultural Research Service showed their latest projects during field day north of Pendleton. The Oregon State University-Cascades bike share program will be available to the public with the opening of a downtown Bend station sponsored by G5, a local digital marketing company. Oregon State University College of Pharmacy presented the 2017 Icons of Pharmacy award to Robin Richardson, Nancy Louie Lee and Gary Miner in May. Amy Burns, Class of 2011, received the College of Pharmacy’s 2017 Outstanding Young Alumni Award. NEW! SEIU: SEIU Classified staff will hold a member meeting in Willamette East room (3rd floor) Valley Library. Attend to get bargaining updates and information about PERS an healthcare. Thursday, June 15, noon – 1 p.m., Contact Siobhan Burke at 630-699-0281 or burkes@seiu503.org for more information. Keith Levien Retirement Party (32 Years at OSU): Thursday June 15, 3 – 5 p.m., Johnson Hall Lobby. Cake and ice cream (if you are in the first 125 arrivals) Sponsored by CBEE Student Club. LGBTQ+ Graduation Ceremonies: In the Memorial Union Journey Room on Thursday, June 15 from 4 to 6 p.m., attend the first ever QTPOC (Queer/Trans People of Color) graduation ceremony, hosted by SOL: LGBTQ+ Multicultural Network. This will be a reception-style event. Then, from 6 to 9 p.m., at LaSells Stewart Center, attend the Lavender Graduation ceremony. These events will recognize LGBTQ+ graduates and those leaving OSU for their hard work and contributions to the community. These celebrations create a space in which students may reflect on their complex journeys and share their accomplishments with friends, family, and colleagues. End of Term Sale: The OSU Beaver Store is hosting its End of Term sale. Big discounts on Beaver Gear, while supplies last. Sale goes through Friday, June 16. NEW! Murphy Retirement: The Auxiliaries and Activities Business Center invites you to a reception honoring Doreen Murphy who is retiring after almost 29 years of service to OSU. The reception will be held on Thursday, June 29 from 3:30 – 5 p.m., in University Plaza, Suite 170. Please RSVP to Courtney Seton at Courtney.seton@oregonstate.edu. NEW! Community retirement reception for Angelo Gomez: On Friday, June 30, members of the OSU and broader community are invited to celebrate Angelo’s commitment to social justice and contributions in the areas of diversity, equity and inclusion at OSU. We will gather from 3:30-5 p.m. in the Centro Cultural César Chávez. The program begins at 4 p.m. where you can share your stories about Angelo’s impacts on our community. Feel free to leave an online message, stories or well wishes for Angelo here. For questions or to RSVP, contact events@oregonstate.edu or 541-737-4717. Air Force ROTC commissioning: Please celebrate with us as the Air Force ROTC 2017 Commissioning will be held Saturday, June 17 at 3 p.m. in the SEC outdoor pavilion. Please join us as we celebrate the commissioning of six new 2nd Lieutenants in the United States Air Force. NROTC Commissioning Ceremony: The seniors of the NROTC Beaver Battalion will be commissioning as Naval and Marine Corps Officers. Rear Admiral Mayes, Commander, Navy Region Northwest, will be the keynote speaker and will administer the oath of office. Friday, June 16, at 10 a.m. in the SEC Plaza. OSUsed Store Public Sales: The OSUsed Store is open for its weekly public sales Friday noon to 3 p.m. at 644 SW 13th. Personal purchases must be made during public sales. Staff may shop for their department 8 a.m. to 5 p.m. Mondays through Thursdays. More information on our website. Reception to honor record number of science graduates: The College of Science is hosting an outdoor reception for all science graduating seniors, graduate students and their families Friday, June 16, from 4-5:30 p.m. on the Valley Library Quad in front of Kidder Hall. The College will graduate a record 629 students with baccalaureate degrees, a five percent increase from last year. All science faculty, staff and advisors are welcome to attend. NEW! Biological & Ecological Engineering Thesis Defense: Keaton Lesnik, PhD Dissertation – Consider the Community: Linking Population and Functional Dynamics to Performance in Microbial Fuel Cells. Friday, June 16, 9 a.m., LPSC 125. Keaton is advised by Hong Liu of BEE. Sustainable Landscape Training & Certification: Learn to create sustainable, green, ecological landscapes that are more efficient in their use of pesticides, fertilizer, and water. Cost is $25. Class is held on June 20 and 21 from 8:30 a.m. to 5 p.m. at the OSU Extension Service-Lane County Office, 996 Jefferson St. Eugene. Registration required. Higher Education Mentoring Symposium: You are invited the 2017 Oregon Higher Education Mentoring Symposium, hosted by Western Oregon University and Oregon State University on Thursday, June 22. This free, inaugural symposium will bring together all of Oregon’s public higher education partners interested in designing, building or sustaining a mentoring program. 8 a.m.-5 p.m., CH2M Hill Alumni Center. Free. Click here to view the symposium agenda and to register. Basic Food Preservation 101- Getting Ready for Summer Harvests: The workshop will include information on canning, freezing, drying, pickling, and making your own jams and jellies. Class held on Saturday, June 24, from 10 a.m. to 1 p.m. at the OSU Extension Service-Lane County, 996 Jefferson St. Eugene. Cost is $15. Registration required. Back by Popular Demand – OSU Technical Writing: Jump start a lucrative career in technical writing with this expert-led 100% online workshop. Learn more. Expand Your Job Opportunities and Communicate More Efficiently with Online Writing Course: Learn how to articulate your thoughts clearly, concisely and with a style that gets your writing read. Get started. Take the first step and learn more. Webinar “Web Design and Development Career Path Essentials:” Gain an understanding of the current web development and coding landscape along with the fastest way to acquiring new web design and development skills. Sign up here for access. Webinar “Find Gold by Understanding the Fundamentals of Data Analytics:” Find out how Big Data is changing everything and giving an unfair advantage to those who know how to utilize it. Sign up here for access. Master Lean Six Sigma Methodology and Advance Business Effectiveness. Apply Lean Six Sigma tools and techniques to a real-world tangible case-study and present quantifiable outcomes. Learn more. Become a Natural Leader in Three Days with New Leadership Retreat in Bend. Immerse yourself in an OSU-exclusive experience designed to enhance your leadership skills, accelerate your self-awareness and increase your team’s overall productivity and satisfaction. Secure your seat. Webinar: “The Semicolon Mystery Revealed;” Elevate your writing and make it more professional and polished by mastering this often-misused punctuation. Sign up here for access. “Sneak Peek at Exclusive Project Management Courses.” Join one of the biggest names in project management as PM expert Cyndi Dionisio pulls back the curtain on her exclusive courses with this fast-paced webinar. Sign up for access. Natural Products Workshop for STEM Educators: Explore how OSU researchers isolate and characterize novel antibiotics from Oregon soil microbes and engineer fungal strains to express new compounds. Discussions and molecular biology lab experiments, topics include epigenetics, genome editing, natural product development. July 10-11, 2017 at OSU-Cascades campus. Cost: Free Funds available to cover dormitory/meals/parking. To register, email Kari van Zee at vanzeek@science.oregonstate.edu Deadline to register: June 28. NEW! Commencement Program: Personalized Commencement Program book with each graduate’s name and photograph is now available for purchase at http://printmail.oregonstate.edu/commencementbook Cost $15 plus shipping and handling. Or phone orders call 541-737-4941. NEW! Monthly Emergency Preparedness Topic – Summer Injuries With summer time activities come summer time injuries. It’s important to have knowledge about different injuries and what steps to take if one should. Download this month’s Preparedness Topic at http://emergency.oregonstate.edu/preparedness-topics. OSU Today summer schedule: OSU Today will switch to its weekly (Monday) schedule beginning June 19, and will resume daily publication fall term. In order to have an item listed in OSU Today for the following week, please send it to osutoday@oregonstate.edu by noon the Friday prior. Apply by June 20 for Hybrid Course Funding—The Center for Teaching and Learning will support faculty redesigning Corvallis campus courses as hybrid courses during fall term. See the Hybrid Faculty Learning Community Request for Proposals for details. Space limited; apply now. Printing and Mailing Services moving campus location: Printing and Mailing Services’ Xpress Stop location will be moving to MU61 this summer. We will be closing all print production on June 16 and will continue shipping services through June 23. Beginning June 24, the Xpress Stop will be closed completely at its current location. We will reopen in late July and all current services will continue to be available at our new location. If you have any questions please feel free to contact Jeff Todd at 541-737-9062 or Jeffrey.todd@oregonstate.edu. P-card update: The message regarding new payment strategy change at Costco is withdrawn and will not be going into effect. The current process will remain in place. Beaver Community Fair 2017 – Registration Open: This fall’s program will be held Wednesday, Sept. 20, – the first day of classes. Registration will be open through Friday, Sept. 8. Event information as well as a link to register can be found online at http://sli.oregonstate.edu/bcf. Questions? Contact linda.howard@oregonstate.edu. Forest Regeneration in Changing Environments Conference: Join us July 11-13 at The LaSells Stewart Center for a conference that will bring together leading forest researchers and practitioners to share the latest research findings on managing forest regeneration and early stand dynamics in changing environments around the globe. Graduate student participation is highly encouraged! Early Bird Registration (save $50!) ends on June 15. For the event schedule, or to register for the conference, see the event website. NEW! Commencement Road Closure Information: On Saturday, June 17 the following roads will be closed from 6 – 11 a.m.: 26th Street – from Western to Campus Way; Campus Way – from 15th to 26th; Jefferson – 15th to Campus Way; Benton Place, Waldo Place, Memorial Place. Ralph Miller Way closed 6 a.m. – 2 p.m.
Hwy 20: Due to the need to remove debris from a previous construction blast, Hwy. 20 between Philomath and Newport will be closed for two hour periods for several nights this week. U.S. 20 full closure times at the west end curve the nights of Wednesday, June 14 and Thursday, June 15 will be: 7:30 p.m. – 9:30 p.m. (open 9:30 p.m. – 10 p.m.); 10 p.m. – 12 a.m. (midnight) (open midnight – 12:30 a.m.); 12:30 a.m. – 2:30 a.m. (open 2:30 a.m. – 3 a.m.); 3 a.m. – 5 a.m. (one lane open from 5 a.m. on through the day). If additional cleanup time is needed, the same schedule will be in place Monday, June 19. Power outage: Pacific Power is making repairs in the underground vaults and the power may be shut off to various buildings Sunday, June 18. The power will be off at 8 a.m. and on between 3-4 p.m. at Arnold, Bloss, Dixon, Finley and Gill. The power will be off from 8-9 a.m. and 3-4 p.m., at the Facility Shops., Goss, ILLC, NROTC and Tebeau. The power will be off from 9-10 a.m. and 3-4 p.m., in LARC and the Refrigeration Trailer. For questions or comments on this notice contact, Stuart Larson at 541-737-8313 or Facilities Services at 541-737-2969. 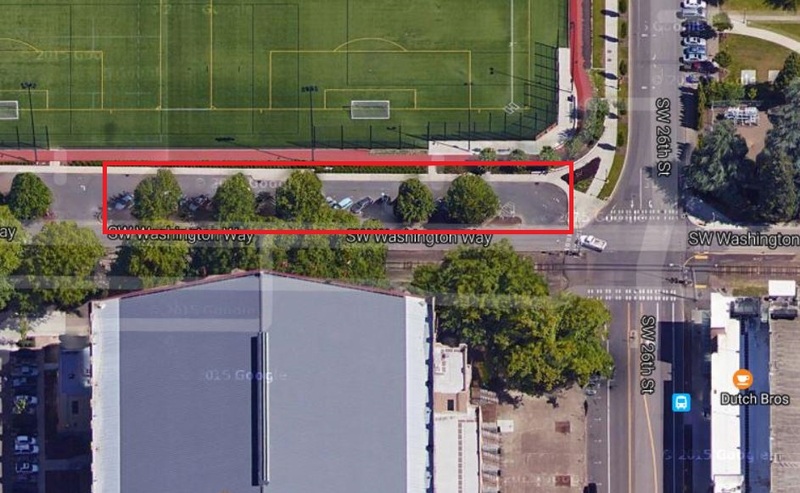 Gill Coliseum: The eastern portion of the parking lot north of Gill Coliseum at the corner of Washington & 26th Street (View Map) will be blocked from Monday June 19– July 31 due to construction on 26th Street. The steam will be shut down in Gill Coliseum from June 27 – July 31 due to the 26th Street steam line replacement project. This will affect all steam services, includes heat & hot water building wide. Motor Pool lot: To facilitate the reconstruction and expansion of the gravel parking lot west of the Motor Pool along Campus Way, all parking stalls will be closed for the duration of the project within the lot, June 12 – Sept. 15. There will also be closures to the adjacent sidewalks and access aisles for limited duration. The access aisle to the Radiation Center will remain open, or the project will accommodate special deliveries. Clark Meat Lab access will be provided as coordinated with the building manager, with pedestrian paths communicated to the public in advance of events and for normal business. General construction noise and dust will be present during the lot reconstruction. Steam shutdown: Each year Facilities Services performs necessary maintenance on the university’s steam system, which requires shutting off the steam throughout campus, to complete maintenance services at the plant, throughout the steam tunnels and in each building. This process affects hot water supply, heating, and all equipment that uses steam, campus wide. The steam shutdown for 2017 will occur June 18, 6 p.m. – June 26, 8 a.m. The Education Opportunities Program invites applications for a part-time (0.25 FTE), 9-month, Fixed-Term Writing Instructor position. Reappointment is at the discretion of the Director. Posting # P00704UF. Closes June 15. Transcriber 1 Pool 2016/2017 – The office Disability Access Services in Corvallis. Invites applications for a part-time (.49 FTE) hourly, 12-month Transcriber 1. Posting #P00597UF, Closes June 15. Transcriber 2 Pool 2016/2017 – The office Disability Access Services in Corvallis. Invites applications for a part-time (.49 FTE) hourly, 12-month Transcriber 2, Posting #P00598UF. Closes June 15. Interpreter 1 Pool 2016/2017 – The office Disability Access Services in Corvallis. Invites applications for a part-time (.49 FTE) hourly, 12-month Interpreter 1, Posting #P00599UF. Closes June 15. Interpreter 2 Pool 2016/2017 – The office Disability Access Services in Corvallis. Invites applications for a part-time (.49 FTE) hourly, 12-month Interpreter 2, Posting #P00600UF. Closes June 15. Director of Strategic Engagement – The College of Engineering invites applications for a full-time (1.0 FTE), 12-month, Director of Strategic Engagement. Posting # P01316UF. Full consideration date: June 16. Closes July 1. The College of Liberal Arts (CLA) at Oregon State University invites applications and nominations for the Director of the School of Language, Culture, and Society (SLCS). The Director leads a unique school of learners, teachers, and scholars in the continuing development of its shared vision. The Director supervises the School’s academic programs (Anthropology; College Student Services Administration; Ethnic Studies; Women, Gender, and Sexuality Studies; and World Languages and Cultures) and serves as chief administrative officer and advocate for the school as a whole. This is a full-time (1.0), 12-month tenured administrator position. Posting # P01152UF. Closes June 16. Assistant Director for Professional Development – The College of Business invites applicants for a full time (1.0 FTE) 12-month, Assistant Director for Professional Development position. Posting P01315UF. Closes June 18. Academic Technologies is seeking a Program Coordinator. This is a full-time (1.0 FTE), 12-month, fixed term professional faculty position. Reappointment is at the discretion of the Director. Posting Number P01342UF. Closes July 1 with a Full-Consideration date of June 19. This recruitment will be used to fill one full-time Project Coordinator position for the Office of University Events at Oregon State University (OSU). This is a limited duration appointment expected to last approximately 1 year and 5 months from the appointment begin date. Posting # P00990CT. Closes June 20. Events Manager – The College of Business invites applicants for a full time (1.0 FTE) 12-month, Events Manager position. Posting # P01344UF. Closes June 20. Student Leadership & Involvement is currently recruiting for an Assistant to the Executive Director. This position serves in a key leadership role for SLI, responsible for providing comprehensive support to the SLI Executive Director, the Student Experience Center, and Student Leadership & Involvement. This is an internal search. Posting # P01356UF. Closes June 23. The Arts and Sciences Business Center (ASBC) at Oregon State University (OSU) is hiring an Accountant 1 position. Posting # P00988CT. Closes June 23. Education Program Assistant 1 – OSU Extension Service Family and Community Health (FCH) program invites applications for a part time (.45 FTE), Limited Duration (approximately 1 year), Education Program Assistant (EPA1) in Lincoln County. The position will be located in Newport, Oregon. Posting# P00982CT. Closes June 23. The Arts and Sciences Business Center Human Resources group is seeking a Human Resources Consultant 1. This is a full-time (1.0 FTE), 12-month, fixed term professional faculty position. Posting # P01358UF. Closes June 25. NEW! Recreational Sports Facility Maintenance and Custodial Services Manager. The Department of Recreational Sports at Oregon State University invites initiative, teamwork, professionalism, and passion for well-being. Full-time (1.0 FTE), 12-month position. Posting #P01365UF. Closes June 28. Oregon State University, Student Leadership & Involvement, is currently recruiting for a Late Night Coordinator. This position will lead in the creation of a new and innovative culture around late night programming focused on safe, fun and collaborative activities. Posting #PO1343UF. Closes June 28. Information Technology Services (ITS) Director – The University Shared Services Enterprise (USSE) in Corvallis. Invites applications for one full-time, 12-month Information Technology Services (ITS) Director, Posting # P01349UF. Closes June 30. Campus Security/Public Safety Officer. OSU-Cascades in Bend, Oregon is seeking applicants for a full-time (1.0 FTE) Campus Security/Public Safety Officer. Posting # P00986CT. The full consideration date is June 15. Closes June 30. Academic Technologies is seeking three part-time (a maximum of 20 hours a week) Student Classroom Technicians. Posting # P02390SE. Closes June 30. Student Health Services invites applications for a full-time (1.0 FTE), 12-month, Advocacy Specialist to serve in the Survivors Advocacy and Resource Center Posting #P01336UFT. Closes June 30. Assessment Analyst – The Office of Academic Programs, Assessment, and Accreditation invites applications for a full-time (1.0 FTE), 12-month, Assessment Analyst position. Posting # P01071UF. Posting closes on June 30. Academic Wage (Transcribers in Training) – The Department of Disability Access Services at Oregon State University (OSU) in Corvallis invites applications for a full-time (1.0 FTE) hourly, 9-month Academic Wage (Transcribers in Training), Posting # P00140AW. Closes June 30. Assessment Analyst: OSU’s Office of Academic Programs, Assessment & Accreditation (APAA) is seeking an Assessment Coordinator and Analyst. This is a full-time (1.0 FTE), 12-month, fixed term professional faculty position. The analyst will provide support in data collection and analytic support for campus wide assessment activities and projects with a primary emphasis on program and student learning assessment. Interested parties should apply to posting # P01071UF. Closes June 30. Director of Admissions and Recruitment/OSU-Cascades. OSU-Cascades in Bend, Oregon is seeking applicants for a full-time (1.0 FTE) 12-month, fixed term professional faculty position as the OSU-Cascades Director of Admissions and Recruitment. The OSU-Cascades Director of Admissions and Recruitment will provide strategic and visionary leadership for undergraduate and graduate student recruiting, direct recruitment marketing, and oversee the office of recruitment. Posting #P01345UF. Closes July 7. The Office of Admissions is seeking a Regional Admissions Advisor. This is a full-time (1.00 FTE), 12-month, fixed term professional faculty position. Reappointment is at the discretion of the Director. This position is required to be based out of the individual’s home who must reside within specified boundaries in or near Portland or as approved. Posting #P01347UF. Closes July 7. The Office of Pre-College Programs is seeking a GEAR UP School Liaison. This is a full-time (1.00 FTE), 12-month, fixed term professional faculty position. Reappointment is at the discretion of the Project Director. Posting #P01361UF. Closes July 12. The Office of Financial Aid and Scholarships is seeking a Financial Aid Director. This is a full-time (1.00 FTE),12-month, fixed term professional faculty position. Reappointment is at the discretion of the Associate Provost. Posting #P01364UF. Closes July 15. Fiscal Coordinator 2– The University Shared Services Enterprise (USSE) in Corvallis. Invites applications for one full-time, 12-month Fiscal Coordinator 2, Post # P00977CT, Closes Dec. 31. The OSU Alumni Association has an opening for a student position on the membership team. This is a year-round position starting in the fall. This is a part-time student position working 10 – 20 hours per week at the CH2M Hill Alumni Center. Lean more about the position at OSUFoundation.org – About – Careers – Student Job Openings. Current OSU students can apply by submitting a cover letter and resume to Christi Kasten, Sr. Associate Executive Director by email at christi.kasten@oregonstate.edu. Education Project Assistant – College of Public Health and Human Sciences invites applications for a full-time (1.0 FTE), 12-month, Education Project Assistant. Posting #P00924CT. Position open until filled. Education Project Assistant – College of Public Health and Human Sciences invites applications for a full-time (1.0 FTE), 12-month, Education Project Assistant (Spanish required). Posting #P00925CT. Position open until filled. Corvallis: “It’s a matter of taking the side of the weak against the strong, something the best people have always done.” Harriet Beecher Stowe. Rain today, high of 67, low of 57. Rain tomorrow. Central Oregon: Chance of rain, high of 66, low of 49. Chance of rain tomorrow. Newport: Heavy rain and windy, high of 59, low of 54. Rain tomorrow.